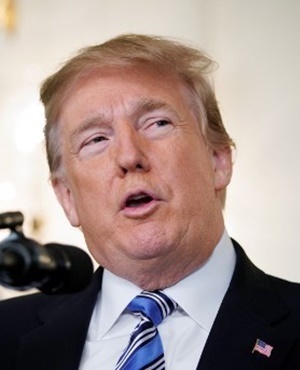 Washington - US President Donald Trump on Friday cast doubt on the character of an armed deputy who failed to intervene during last week's school shooting in Florida, saying he froze or was a "coward". "They're trained, they didn't react properly under pressure or they were a coward," Trump said, calling out the school resource officer Scot Peterson by name. "When it came time to get in there and do something he didn't have the courage or something happened," Trump said. "But he certainly did a poor job. There's no question about that." The Broward County sheriff said on Thursday that Peterson was present during the Valentine's Day rampage that left 14 students and three teachers dead at Marjory Stoneman Douglas High School, but did not act to stop it. On Thursday he doubled down on the National Rifle Association's longstanding position that armed Americans were the first line of defence in confronting deadly attacks, saying: "To stop a bad guy with a gun, it takes a good guy with a gun."